More than one-third of adults in the US live with either diabetes or prediabetes, a report released by the Centers for Disease Control and Prevention (CDC) has revealed. It found that in 2015 there were 30 million people with diabetes, while a further 84 million people had prediabetes. Left untreated, prediabetes often results in patients developing type 2 diabetes within five years. In 2015, an estimated 1.5 million new cases of diabetes were diagnosed in adults aged 18 and over. The rate of diagnosed diabetes was higher among older age groups, with 25 percent of adults aged 65 and over found to have the condition. Commenting on the findings, CDC director Brenda Fitzgerald, MD said: "Now, more than ever, we must step up our efforts to reduce the burden of this serious disease." "Although these findings reveal some progress in diabetes management and prevention, there are still too many Americans with diabetes and prediabetes… More than a third of US adults have prediabetes, and the majority don't know it," she warned. The report found nearly one-quarter of adults living with the disease were unaware they had diabetes. Perhaps more worryingly, nearly nine out of ten people with prediabetes did not know they had the condition. The statistics were described as "staggering" by chief scientific, medical & mission officer at the American Diabetes Association (ADA) William T. Cefalu, MD. He highlighted the "enormous" human and financial costs of diabetes, adding it would be "critical for us to continue to provide the education and support needed to improve health outcomes and decrease the daily burden of diabetes". The ADA echoed the CDC's call for greater urgency in reducing the burden of diabetes, calling for "renewed attention to and investment in stemming the diabetes epidemic". The development of type 2 diabetes is nearly always preceded by prediabetes. It is a symptomless condition, but patients often have higher than normal blood sugar levels. Left untreated, prediabetes usually develops into type 2 diabetes within five years, according to the CDC. Older people are more likely to develop diabetes, but other risk factors include: a family history of the condition, being overweight or obese, high cholesterol, and lack of exercise. 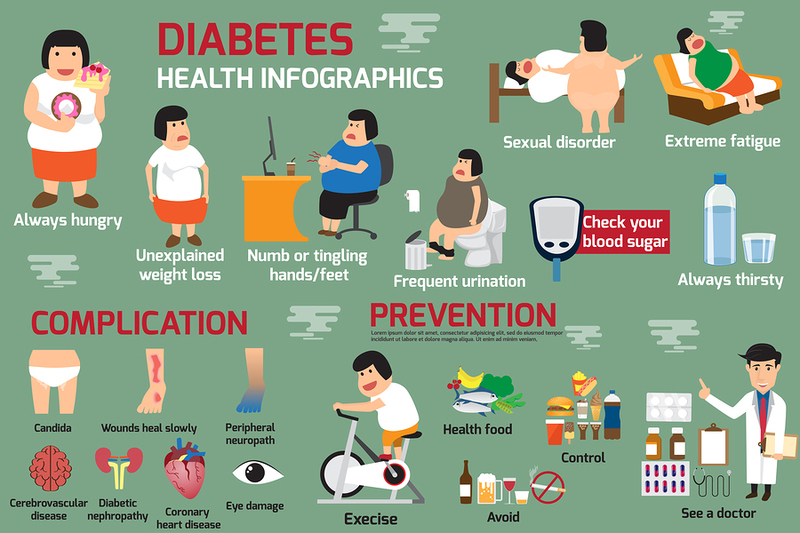 Patients with diabetes are at a significant risk of developing further complications, such as kidney failure, heart disease, stroke, amputation of lower limbs and blindness. However, lifestyle changes and medication can reduce risk and delay onset of type 2 diabetes. Diabetes can be managed with lifestyle changes, such as an increase in physical activity and change of diet. The recent CDC study found 40 percent of those with diabetes or prediabetes were physically inactive (getting less than 10 minutes a week of moderate or vigorous activity), while 87 percent were overweight or obese. Insulin is often used to manage blood sugar levels, and other medication may be prescribed to help patients with the symptoms of diabetes. Insulin is a hormone naturally formed in the pancreas and which enables cells to use glucose. Man-made insulin is used to regulate blood sugar levels in diabetic patients a number of different varieties of generic and branded insulin and diabetes treatments are available. Earlier this month, pharmaceutical giant Merck was given tentative approval for a new insulin glargine injection called Lusduna Nexvue, which may be on pharmacy shelves within 30 months or less. What varieties of insulin are available? Rapid-acting insulin such as Humalog (insulin lispro) starts working within minutes but only lasts for a couple of hours. Regular or short-acting insulin takes around half an hour to work, but will continue acting for up to six hours. Intermediate-acting insulin takes between two and four hours to take effect, but will work for up to 18 hours. Long-acting insulin, such as Lantus (insulin glargine) or Levemir (insulin detemir), continues to have an effect throughout the day.